Are you a U.S. citizen thinking about studying in Canada? Smart thinking! Canada is a modern, progressive country with friendly, open-minded citizens, and is famous for both its large, dynamic cities and its picturesque, untouched landscapes. The Canadian education system is also ranked among the best in the world, and credentials from postsecondary institutions – including Ontario's colleges – are widely respected in the global market. Our job market is thriving, from large-scale industry to entrepreneurship and small business. What Does It Mean to Attend College in Canada? In the U.S., the term college encompasses a variety of postsecondary institutions, but here in Canada, we use it a little differently. Canadian colleges provide career-focused education with practical, hands-on training in applied fields like business, technology, the arts, health sciences, skilled trades and more. Programs come in varying styles and award many types of credentials, from 1-year certificates and 2-year diplomas to 4-year bachelor's degrees. Colleges are also known for their small class sizes, inclusive and welcoming campuses, and their numerous student services and supports. Ontario's colleges are also where education and industry come together, supporting innovative research projects in a variety of fields – including agriculture, computer technology, environmental science, medicine, telecommunications and many more. The average tuition cost for international students is $14,000 in Canadian dollars per year (2 semesters), or about $10,500 U.S. a year at the current exchange rate. Canada offers the lowest tuition rates for international students compared to the U.K., Australia and New Zealand. The strong U.S. dollar also means you'll get more bang for your buck when it comes to living expenses like rent, utilities, food and transportation. You may know us as your Neighbours to the North, but we're closer than you think. 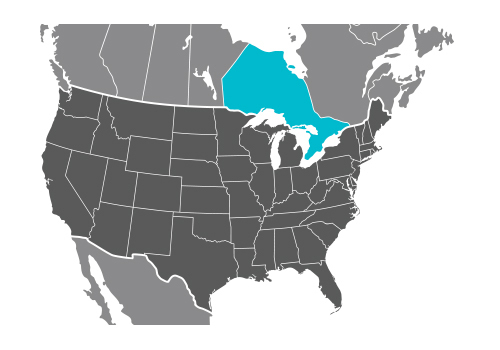 Of Ontario's 26 colleges, 5 are located in cities along the Canada-U.S. border. An estimated 75% of Canadians live within 100 miles of the U.S. border. Canada is well-known for being diverse and inclusive and here you'll find everything from ethnic food and cultural celebrations to support and services for newcomers. Student advisors at any of Ontario's colleges can help you connect with ethnic clubs and organizations in your area. More than 1 in 5 people in Canada were born outside the country. You've probably heard that Canadians are friendly and polite, but what you may not know is that Canada consistently ranks among the best places in the world to live by the United Nations. We're home to stable, peaceful communities and have low – and steadily declining – crime rates. Still not convinced to study in Ontario, Canada? Check out our Why College page for 10 more reasons why choosing Ontario's colleges just makes sense. If you've already decided studying here is the right choice, use our program search tool to explore programs or visit our Applying to College as an International Student page and follow the instructions to begin your application. Ontario college international student fees are approximately $14,000 in Canadian funds per year (two semesters). Some colleges may accept tuition payments in U.S. funds. Colleges may also charge administration fees and ancillary fees that cover things like photo I.D., health insurance and student services. As an international student, you aren't eligible to receive financial aid from the Canadian government. If you're applying to a degree program, you may be eligible to receive financial assistance from the United States' federal student aid program. Check with the college(s) you're applying to find out if they participate in this program. Once enrolled at an Ontario college, international students typically qualify for the same awards and scholarships as other students. The Canadian government regulates the admission of international students to Canada. These regulations are subject to change. Contact the Embassy of Canada in Washington or Citizenship and Immigration Canada for more information. Once you’ve received a letter of acceptance from an Ontario college, you'll need to apply for a study permit (Form IMM1294). You can apply for a study permit online, or you may obtain a paper application from the Canada Visa Application Centre. There is an application fee to apply for a study permit (see the Citizenship and Immigration Canada fees page for details). Please note: Applying for a study permit does not guarantee you will receive one. If your application is not approved, you will receive a letter from the visa office explaining why it was refused.